Time for a Maggie update: Maggie has taken the first step in her move towards being a Rhodes scholar (or maybe a Road’s Scholar) – she has rolled over! I know it’s a big deal, all the baby books say so. I just wish I would do a better job cleaning up the floors so that Maggie didn’t turn into a rolling dust mop. Over the last week or two, Sophie’s temper tantrums seemed to be getting worse. The final straw was on Friday, when she begged me to take her to work. I had to leave, and sadly) bolted the door when I left. It seemed like Sophie was in some big power struggle with us – was it because Maggie was in the picture? We received all sorts of advice – you can’t give in to her, she’ll just walk all over you after this, etc. We were told that we had been giving her “too many choices” and that we had to limit the options we gave her to two at a time. We were also told to ignore her tantrums – they would work themselves out, and by responding to her tantrums you would be giving her the power. It took Betsy (aka SuperMom)to discover what really worked. Saturday afternoon we had a doozy – we were getting ready to change her diaper, and Sophie broke down. “No diaper change! No new diaper!” We told her she had to get her diaper changed, and it was full of “potty”, but it was no use. “No diaper!” With this, it happened. She stripped off her pants and diaper, and stood there as naked as the day she was born. We couldn’t get anything on her, and we thought anything could happen at any moment. She could vomit, pee, spit fire, and who knows what else. Betsy took the chance, and grabbed her, and held her. She talked Sophie down like a police negotiator with a jumper. After about five minutes, we wrapped a towel around her. After ten, she agreed to wear her diaper. After fifteen, all was well. It was masterful. I was really impressed, especially since our little hellion was impossible just a few minutes before. After this, I started to think – what was it that Betsy did that made the difference? I didn’t know if I could go through all that she did to bring Sophie down, but maybe I could deal with the tantrum while it was a category 1 or 2, before it was Sophie Tsunami. I had an idea, and thought I would try it the next time around, which I suspected wouldn’t be too much later. On Sunday, I was getting the two kids ready to go out. We had been in the house all day, and we were all bouncing off the walls. I had Maggie on my lap, and told Sophie to get her shoes. And it happened. I breathed deeply. It was time. That was it. It worked. By just stopping and holding her, I was able to prevent the tantrum. I was shocked and awed. For the past few weeks we had been reacting to Sophie’s tantrums by getting into “battle mode”, ready to handle whatever Sophie threw at us. The truth was, we needed to do the exact opposite – embrace the tantrum, and hold Sophie until she was settled down. I thought about how this happened, and have my own theory: So much of what we’ve done with Sophie has been to help her to become independent, or to support her while she tried to be independent. At some points, she must feel too independent, and that she needs to feel more centered, or more connected to us. Despite being able to communicate a lot of what she wants (she’ll tell us that she’s tired, hungry, hurt, etc), she couldn’t figure out why she feels the way she feels, and just breaks down. At least that’s what my opinion is, based on my complete lack of education in psychology. The good news is that we’ve both started reacting to her Category 1 tantrums in this way, and it’s made all the difference. No more breakdowns, no more “Sophie Tsunami”, no more running around without diapers on. Well, that last part isn’t true. But that’s for another day. Sophie announced to us today that Po has diaper rash. When we took a look, sure enough, the Tellytubby had a red bottom. The best part is that Sophie took the initiative to put Desitin on her right away, leaving us to clean up. Now that I post these entries, I’m able to recall all those things I forgot the first time around with Sophie. I suspect that my poor memory means that I have Alzheimer’s in the not too distant future (or I already have it and don’t remember). Maggie has started to do all the “baby” things that make kids more interesting. She has started grabbed at toys and playing with them, smiling, and even laughing (although Betsy is the only person who can get a laugh out of her). Her newest activity is the half-roll. She starts to roll over, then stops herself about ¾ of the way through. I suspect she’s worried about what will happen if she actually succeeds. She may never see the world from on her back again! 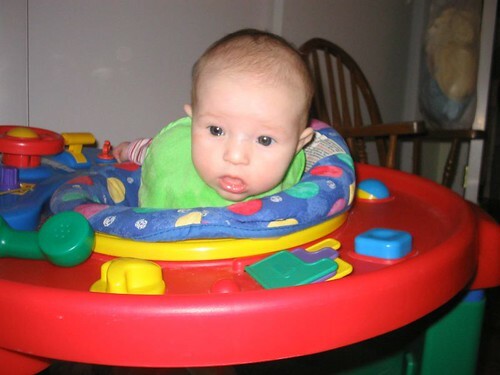 We’ve also started her in the “Tilt-A-Whirl”, which is an Exersaucer. The one that Mr. Nice Guy has is so modern super-fancy…of course it looks like a jester exploded on the thing. We have an old-school 10 year old (classic I call it) version. It has about 1/20 the fancy objet d’art that the new ones have, but I don’t care. In the photo to the left it seems that Maggie is struggling just to survive the Tilt-A-Whirl, but by yesterday she was an old pro. The best part? How proud she looked in conquering the thing. She seemed to want to show us how she could stand up and play! Good Job Maggs! I've rented out some side space again, this time to Dana over at Southern Gal Goes North! She's a humor writer who moved up from Alabama (Roll Tide!) up to Chicago (Roll a Vienna Hot Dog). Check out her blog, especially if you've ever been to Disneyland! Gastric Juice, Coming Right Up! What a week…where to begin? Friday 12/30: Known to me as the Puke-A-Thon. Betsy hates that word, so I’ll call it the Driving-the-porcelain-bus-A-Thon. At about 2PM we were heading out for lunch, and had just driven through the entire parking lot at the mall to find a spot. We had just pulled everyone from the car, set up the stroller, had Sophie ready to walk, and – it happened. Sophie surprised us…no warning, no announcement, just a quick gagging noise, and out it came. A stomachfull of lunch, crackers, cheerios, water, and I’m not sure what else. The best part? She hurled in the only other open parking spot in the lot. Now, I’ve seen some impressive ways to reserve a parking spot, but she gets an “A” for creativity! It was over so quick that I thought (for just one moment) that we could just continue on…after all, that’s what I used to do after hurling. Of course, that was usually due to drinking beer after liquor (“never sicker”). Betsy corrected me. It was time to go home. She had already pulled out the spare outfit that she had prepared for this kind of occasion out of her “Super Mommy” utility belt, and changed Sophie. The way home was great too – we hit traffic (of course), and Sophie spent most of the ride getting out whatever little bit was still in her stomach. Luckily (for me), she got most of it on herself and not the car (wow, that sounds cruel). To put it another way, the “spill was contained”. The amazing part was that she wasn’t complaining too much – she would just groan, cough, and vomit. After getting home we took her to get a bath (“No Bath! No Bath!”), which was probably the worst part of the afternoon for her. She wanted to lay down, so I laid with her in the “big girl bed”, which she quickly puked in. Great, another outfit, and change the sheets on the bed. Now, it’s into the crib (where she usually sleeps). She hurls again. Change the sheets (and her pajamas), and get her set up again. We tried to lay a towel down in the bed, but she would have none of that. We let her lay down again, and had a grocery bag set up so we could grab it in case she was ready to hurl again (known as the “Gag Bag”). She seemed OK, so we left. Five minutes later (this was now about 4PM) we hear the now familiar “Gag and Cough” (not to be confused with “Shock and Awe”), and before we got to the room she had ruined another pajama/sheet set. This was a first – usually when Sophie vomited it was a one-time incident. Instead we got her out of the crib, brought her downstairs, encased the couch in towels, and sat with her for the rest of the evening until she was able to go more than 30 minutes without yakking. That wasn’t until 7PM. Then we finally started the laundry.